Counter Terrorism or Limits on Religious Freedom? Terrorism and religious extremism have found a home in Central Asia long ago. Ties between Central Asian terrorist cells and this in Afghanistan and Pakistan are deep. As fear of increasing terrorism and insurgency rises, Central Asia is increasing efforts to curb extremist tendencies in society. 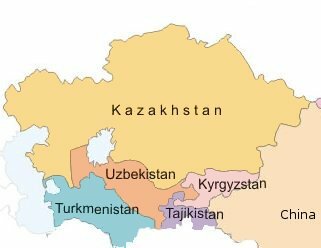 Either through counter terrorism operations, education of its citizens, or simply increased security, Uzbekistan, Kyrgyzstan, and Kazakhstan are working to both prevent and address matters of Islamism in society. Kazakhstan‘s efforts to shut down religious organizations not properly registered with the state have been effective, albeit brassy criticism of religious intolerance by state government. This past month, the list of permitted religious groups was shortened from 46 to 17. This comes after a year long effort to follow the controversial religion law set in place after the first ever terrorist attack in the country. All religious organizations were given a year to reregister under new stringent laws. Critics refer to these efforts as limiting religious freedom and lobby the state to change the controversial law. Opponents cite Kazakhstan’s hypocrisy as the country prides itself on its open society, where many different religious and ethnic groups harmoniously live while implementing such repressive measures. Uzbekistan is engaged in preventative measures to counter extremism. Moderate spiritual leaders and local law enforcement units are uniting to educate students from every Oblast about the threats of extremism in Uzbekistan. Law enforcement units are also conducting raids on cell phone companies to prevent extremists from getting hold of cell phone data and transmitting religious material. Additionally, the metro system is receiving an upgrade this month. Closed-circuit TVs (CCTV) and random searches are among precautions being taken. The CCTV system allows designated personnel to monitor station tunnels. Toxic and flammable material is no longer permitted on the metro. Neither are firearms. Critics cite these measures as intrusive of personal freedoms and try to persuade the state to cease its invasive agenda. They believe that these measures are a ploy against personal freedom and religious liberty of its citizens. Kyrgyzstan seeks to prevent recruitment of youth into extremist organization. Recruiting the youth into extremist organizations such as Hizb ut-Tahrir, associated with the Taliban, is just one tactic that extremists are using to seek volunteers. According to the Interior Ministry, “In the first 10 months of this year, 176 members of extremist religious organizations were arrested in Kyrgyzstan and 204 cases of crimes involving extremism were registered – 132 in which criminal charges were brought.” In light of this trend, Kyrgyz authorities are considering increasing their religious education so that minors would grow up knowing the differences between extremism and moderate sects of Islam. The Spiritual Administration of the Muslims of Kyrgyzstan (DUMK), the largest association in the country to monitor all activities of religious organizations in the country, is reforming its strategies, too. The entire institution is reorganizing in order to be able to able to fight extremism in the country. Opponents view the situation is just one more instance of state control where the government is monitoring the activities of its citizens and dictating what they can and cannot do. Neither the critics nor the government officials are right in their approach. Central Asia needs to learn from its neighbors and supporters on how to deal with extremist threats if they want to succeed in curbing extremism. Because extremism in Central Asia is on the rise, both local and federal governments are increasing their efforts to counter these threats. Those engaged in these efforts are working on both preventative and responsive ways to deal with evolving and innovative threats of terrorism and religious extremism. Although there is criticism that these efforts limit religious freedom, there is simultaneous pressure to increase counter terrorism training and preparation. We must learn to work together, creating a comprehensive reform strategy if we want to create a safe and welcoming society for moderately religious citizens. Tags: Central Asia, CT, Extremism, Terrorism. Bookmark the permalink.